So after finishing the DLC content I decided to start testing out all the new weapons as some of them looked pretty interesting. Below are my findings and thoughts, along with input others have shared. I will keep updating as/if more information is discovered and confirmed. 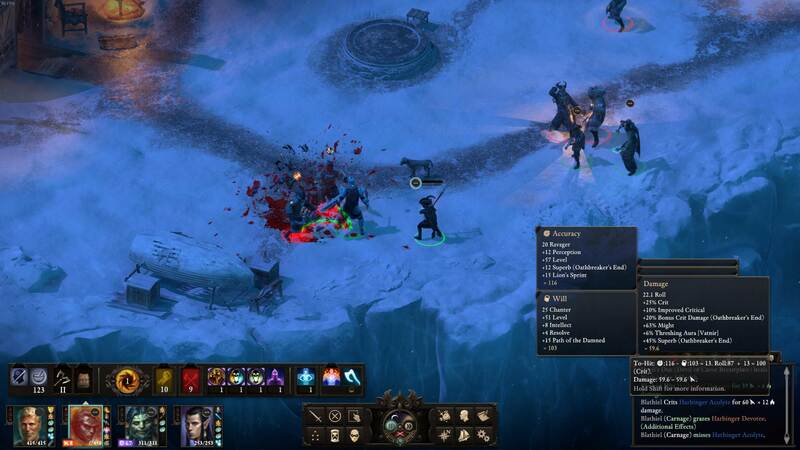 - Harder than Ice stacks last till end of combat and can be gained from friendly fire. Could use a fast ticking freeze dot such as Ninagauth's Bitter Mooring to gain an easy +3 pen. Problem is you can only select one enchant, and it's only other unique property is 10% raw lash. - Chaos Strike doesn't have any correlation between types of affliction it applies - I stunned the enemy while distracting myself. Could synergize nicely with some of the new "gain x while afflicted" gear; make sure you have no inspiration before using (obviously). Corrode damage scales with level (+25% at lvl20 multiclass/PL7) along with all the usual weapon damage modifiers. Mutually exclusive with Dispersed Suffering. 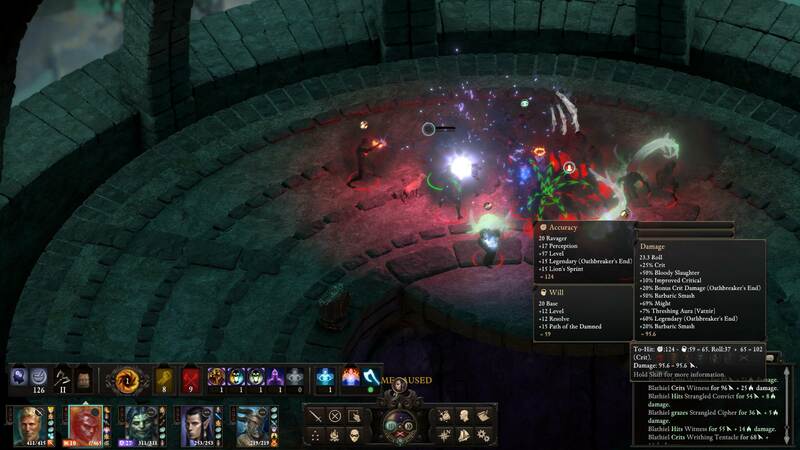 - Dispersed Suffering doesn't care how you get the kill; spells, offhand weapon, DoT chants, etc. Radius isn't stated, however appears to be somewhat bigger than carnage. It currently gives +50% duration as opposed to the +20% on the description - likely a bug. Will extend chants (tested with Dragon Thrashed) and also can proc off killing friendly targets. Targets the foes will defense, so triggers on attack effects (Stagger from Spirit Frenzy, Avenging Storm); next kill will extend durations and so on. I had one mob with ~550 second stagger duration. Obviously that's overkill but you can get creative with your afflictions/DoTs. - Encroaching Frost can proc from spells. I have confirmed this can proc from Dispersed Suffering, which will then be extended by it and so on. With enough crit chance you could (potentially) permanently paralyze an entire group using your own skelebros (resistance/immunity aside). Mutually exclusive with Shattering Head. - Shattering Head was underwhelming; damage is comparable to Frostseeker but proc is less reliable (30% vs guaranteed) and it doesn't damage the primary target, unlike Frosty. Crit has to be with the mace for it to proc. - Does not gain penetration from Secrets of Rime. This is a bug and a fix is being worked on. - Flow and its upgrade do quite high damage, however the low proc chance makes it fairly unreliable. Maybe on a ranger with driving flight and twinned shot? - Low Tide enchant crit damage also applies to spells. - Ebb stacking hit to crit chance is weapon only - would have been perfect caster weapon otherwise. - Scales of Justice DoT damage appears to be base 3, scaled with standard damage modifiers (superb, might, threshing aura, etc.) but not from the skill that applied it or crit damage. This is in line with other non-percentage DoTs so makes sense. - Found Innocent heal amount looks to be the same as Abraham - that is both Abraham and this gave me 17 health on kill. Mutually exclusive with Found Guilty. - Found Guilty looks to be the best - raw damage AoE, uses full weapon base damage (18-24) plus passive and ability bonuses (with lashes on top), can crit and targets the will defense. Using the new Slippers of the Assassin you can get Assassinate and Backstab (depending on distance) to apply to the proc, but only once per fight. Swashbuckler using Clear Out from stealth with as much AoE as you can should apply the DoT to a large number of mobs, allowing a chain reaction of heavy raw damage as they start dying. Applies on attack effects such as Staggered from Spirit Frenzy/Tornado, Avenging Storm, etc. - Currently shares base penetration with one handed battle axes (7), this has been reported as a potential bug as version 1.2 increased two-handed penetration by +1 across the board. This is likely an oversight but hopefully we will know soon. - Renewal was harder to test, as I got the gaping wound injury (-25% healing), however it would appear to be 10 + 10/religion + modifiers. - Death's Embrace is very hard to measure. 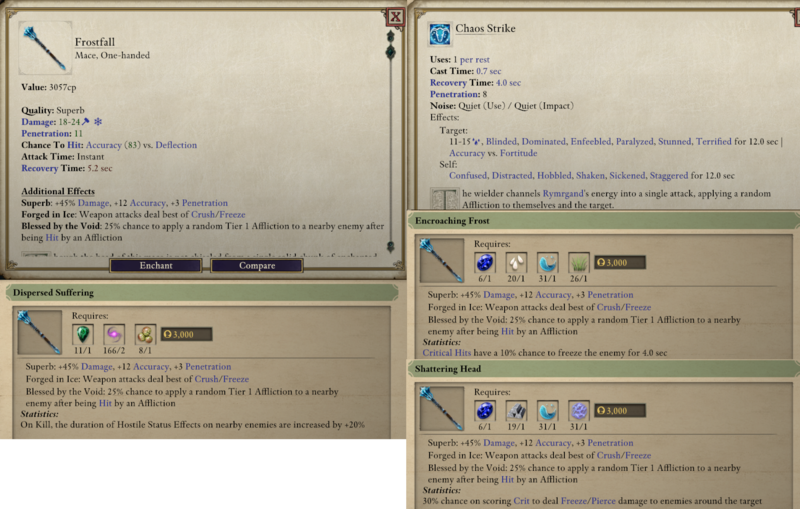 I've done two tests so far which is by no means enough to come to conclusions on an RNG based effect, however in the first test I got 3 conversions due to the sword across 2 Hear of Fury's (~12 connections total per use) while the second test with exactly the same conditions saw 0 conversions. At a (very rough) guess I'd say it's something in the region of 2%-5% base + 0.25 per religion. - This matches what grasida said here. - Soul Diplomacy seems to be the obvious pick for the creature upgrades; why risk reinforcing your foes? So far in my very limited testing I've seen a range of monsters including but not limited to: Young Boar, Imps, Lesser Slime/Ooze, Gul/Dargul/Algul, Lagufaeth Mage, Ogre Pirate, Bird. The duration isn't fantastic but it's ok. Sometimes it didn't spawn anything even though the debuff was active and the visuals triggered. This is a bug so expect a fix soon. Another bug I've discovered is that Essential Phantom can apply the base debuff on top of the upgraded debuff. This is because EP will always only get the base version of your items. Expect a fix for this too, also as the base summon can be hostile, this isn't really that great. - Lashes are mutually exclusive (duh) and seem to scale at 0.25 or 0.5 per point of Metaphysics (I only tested one but they will be the same rate). Up to preference really which one to take, though shock obviously fits the theme better, aslo there are far more fire immune enemies than shock, including those that heal from it. - Gains penetration from Heart of the Storm passive, presumably also from other sources (if any exist?). After some further testing I believe the Oathbreaker's End has a lot of potential for AoE fights, however it is lacking when it comes to ST. Still had a lot of fun testing it and will probably build around it for my next run. 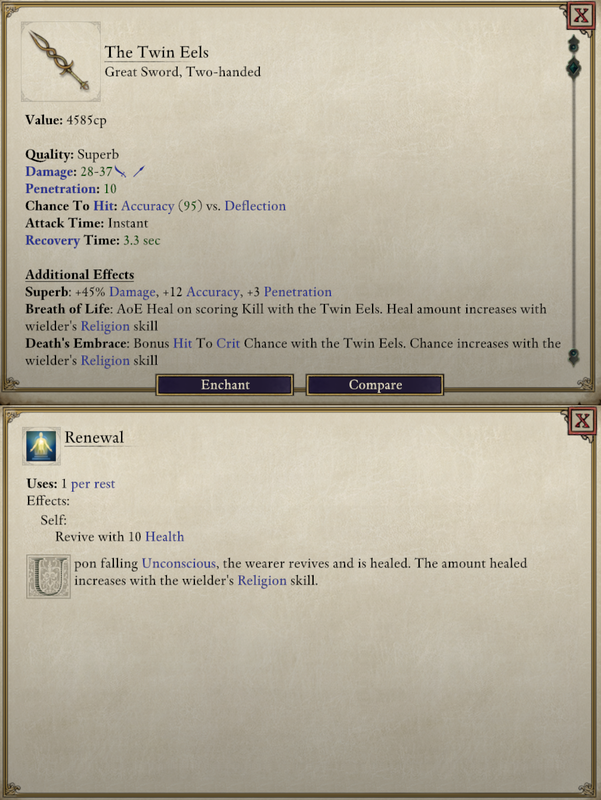 What Twin Eels lacks in damage (outside of being a 2-hander) it makes up for in sustain - 40 health per kill is no joke, can't be bothered further testing the hit to crit though. Frostfall is probably my second favourite at this point, though I feel it will mainly be used as a stat stick due to it's two best enchants applying universally. The Essence Interrupter is interesting, but outside of the summons it's pretty ordinary. 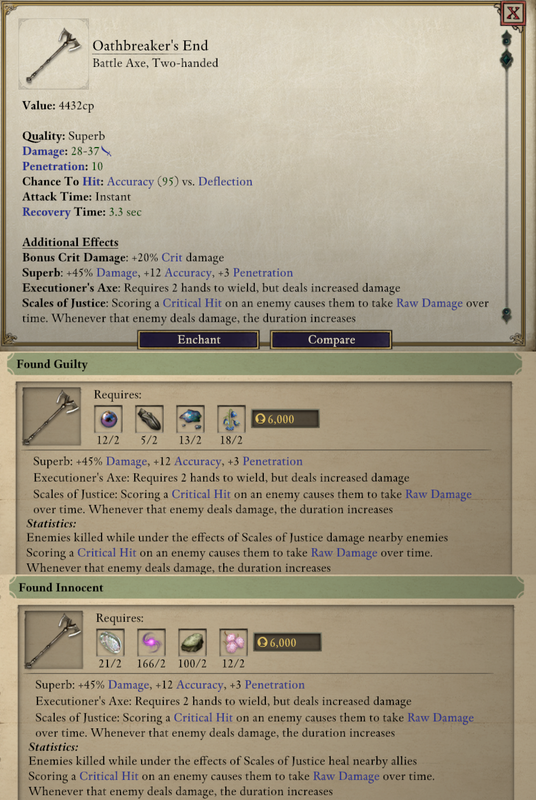 Having another elemental damage weapon is quite nice though. The lashes are nice but other weapons offer the same without hogging skill points. Edited by thundercleese, 14 August 2018 - 01:22 PM. - Encroaching Frost can proc from spells. This is hopeful. As in hopefully it doesn't get changed to just weapon proc. I don't know where the GS is gotten. But I played around with it. The Renewal enchantment is quite bad - 10 health on revival didn't scale. The saving grace is that the revival will proc about 3-ish seconds upon being knocked out. But the revived char will likely drop again as soon as the enemy sneezed in its direction. It scales pretty well with religion for me. +10 health per point of religion before might or other bonuses. If you’re maxing religion, it’s very solid. Overall it seems like a really nice weapon for a more fragile character. I wish two handers were more attractive in general. Oh it scales off Religion? I guess it was implied, but I didn't see it in the enchantment description. Then maybe it is not too bad. But the health gained definitely not scaled from might bonuses. Edited by mosspit, 04 August 2018 - 05:55 PM. Yeah it was quite nice - I got 9 crits from an empowered Ninagauth and a couple extra freeze procs, one of which crit up to almost 10 seconds. Probably got extended further from Dispersed Suffering though I didn't check. Yeah two handers are pretty lacking in general, though the new axe looks cool. Not sure about the enchants on it but I still wanna give it a go. What other enchants/abilities does the sword have? Edited by thundercleese, 04 August 2018 - 06:00 PM. Edited by mosspit, 04 August 2018 - 06:05 PM. Thanks. Wish these new items at least told you what the base value for these scaling bonuses is. Like the ring from the DoMT with hit to crit based on your wealth - I have no idea how good it is because nowhere in the game tells me. I'm guessing it's a pretty steep curve due to how easy it is to amass money though. Edited by thundercleese, 04 August 2018 - 07:23 PM. - Dispersed Suffering doesn't care how you get the kill; works with spells too (had a 18 second paralyze from Ninagauth's Shadowflame ). Radius is bigger than carnage. 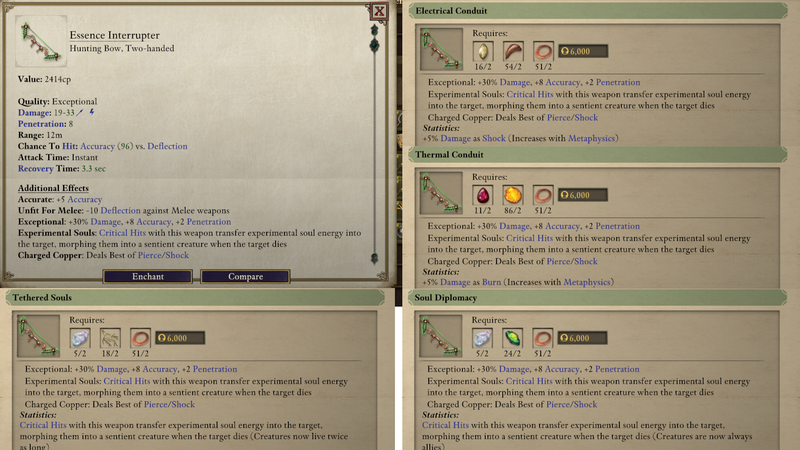 Combat log was saying +50% effect duration as opposed to the +20% on the description. Don't have a chanter in my party, but I imagine it will also extend duration of your chants on the enemies. Not sure if someone wants to try something with that (I'm thinking along the lines of the Lord of the Imps build, though I've never been good at Chanters). - Shattering Head is probably not worth it; even with swift flurry and heartbeat drumming I struggled to get it to proc. Damage is comparable to Frostseeker but proc is less reliable (30% vs 100% chance) and it doesn't damage the primary target, unlike Frosty. Does not seem to proc from spells, or I just got really really unlucky. Makes sense but at the same time, both its other enchants proc from spells so a little inconsistent? -- Therefore probably best in the hands of a caster, or at least in a party with an AoE debuffer. - Ebb stacking hit to crit chance is weapon only. - Found Innocent heal amount looks to be the same as Abraham - that is both Abraham and this gave me 17 health on kill. - Found Guilty looks to be the best - raw damage AoE, uses full weapon base damage (18-24) plus passive bonuses (with lashes on top), can crit and attacks will. That's all I've tested so far, will update as I do more, or if others wish to share their experiences. Still haven't found the twisted sword and I've finished the DLC so if anyone could tell me where it is that would be greatly appreciated. So, is Oathbreaker's End a Battleaxe or a Pollaxe? It looks like a Pollaxe, but I've been told it keys off of the Battleaxe modal? I'd like to try it for my Barbarian/Rogue. It is a Two handed Battleaxe. 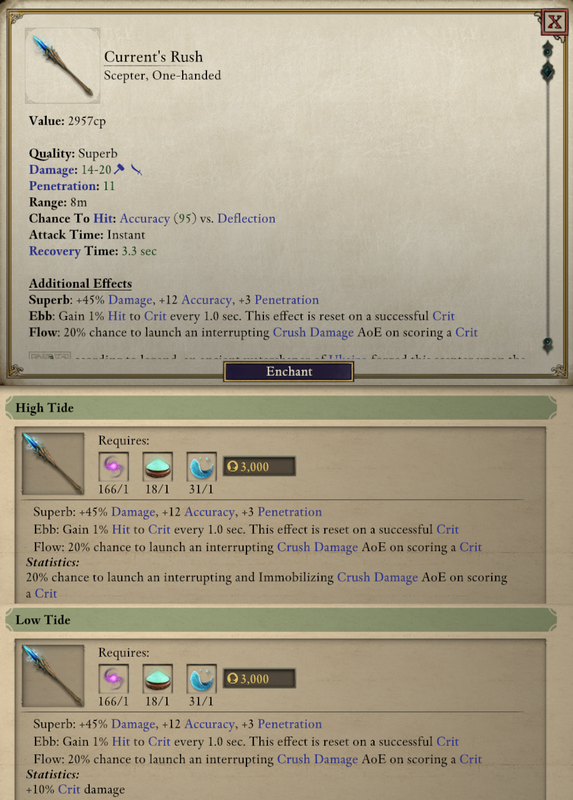 Think of it like Abydon's Hammer from PoE1. I agree that it’s really frustrating that they don’t tell us the specific numbers for these item properties. Twin Eels seems to heal 10+religion per kill and for something like religion*10 on revive. The hit to crit is not 1% per point of religion, because I set my religion to 100 and was still getting regular hits. I haven’t tested thoroughly, but I guess it’s something like .5 or .75% per point of religion, which is disappointingly low, given that crits only seem really valuable for a few certain builds. I gave myself 99 million gold and took 20 swings or so with the ring equipped and didn’t see a single conversion, but it’s effect also doesn’t appear on my character sheet, so who knows. I think I saw some posts which complain about the ring's gold scaling wasn't working properly. With that, the Cloak of Poverty might have issues too. Okay so either the ring is bugged or completely worthless, good to know lol. Okay I did some further testing with the Axe and well, I was wrong about ability damage not applying to the AoE; I now strongly believe this was due to a bug. Edited by thundercleese, 06 August 2018 - 07:26 PM. And Found Guilty looks good. Similar to Sungrazer's Extinction Event, but more reliable since kill doesn't need to be done by a crit. Alright! So does it have the damage/penetration of a two-hander, or a one-hander? For threshing you just have to choose dialogue options that are 'darker'. Also any option to tell her to "gather more souls" will help push it in that direction. Don't think what you say at the end of the quest matters, unless maybe you've been giving mixed responses? Yeah I'm definitely going to play around with Found Guilty some more, ideally you'll be chaining them with Blood Thirst. I like the idea of pure Berzerker however you really need int to maximise the AoE, which comes free with Monk. 18-24 damage, 7 penetration (base). So basically a greatsword but single damage type. Edited by thundercleese, 04 August 2018 - 08:21 PM. Re: Frostfall’s Dispersed Suffering, do you think the 20% / 50% thing is a bug, or the number’s scaling with something? Where exactly is Frostfall to be found? EDIT: Nvm, figured it out. It's in the Shattered Passage, but you need all three quest Trinkets to obtain it. Kaihoa to change the flow of water blocking the path to the top left gate, Betrayal to fool the Kuaru spirit into letting you pass, enter the gate to transport yourself to an isolated part of the map, Waidwen's Sundial to create a path (enemies will show up at this point), and finally Betrayal again to fool the Glamfellen spirit into giving up the weapon. Edited by Ascaloth, 04 August 2018 - 10:58 PM.